The Avaza Contacts module makes managing contacts, like team members and external contacts, easy. Here you can invite new team members and contacts, add contact information or business details, set up daily availability & user tags, and assign them appropriate roles so they can access the relevant functions in Avaza. To access this functionality, click Contacts on the Side Navigation. Team members are people who work for your business, like your employees, freelancers or contractors. External contacts are your clients. They can limited access to your Avaza account (they cannot be project managers, or approve expenses, etc.). Under the Contacts module, you will notice tabs for Team, External Contacts, and Archived. Each tab displays all the people already added under each type, as well as their email address, contact information and the status of their Avaza invite. You can also search through Contacts by any of the visible text fields (for example by invitation status, email, user role, user tag, etc). To add a new team member to your account, navigate to the Contacts page and click ‘+Add Team Contact” on the Team tab. An email invite is sent by default, but you can uncheck the box if you do not wish to send one. If left unchecked, you can send out the invitation via the Contacts page at a later point. Invitees will need to click on the invite link they receive in their email and set up their Avaza preferences (password, time zone, etc). Only the email address and name fields are mandatory when adding a team member to your account. Position Title, Mobile and Phone Number. Default Billable Rate: The default hourly rate you charge for their work. Default Cost Rate: What their work costs you per hour. Working Hours Per Week: Number of hours you expect them to work. Timesheet Reminders go out to users who have a value entered in working hours per week and have tracked less time than that. You can set a default availability via Scheduling Settings and override the hours when adding a new contact if need be. The availability is also displayed on the Team Schedule page. User Tags: Tags can be used to highlight user skills, domain, location, etc. You can set these up via Settings > Scheduling Settings before you can assign them to a user. Tags are displayed on the Contacts and Team Schedule pages for reference and can be used to search for specific users. 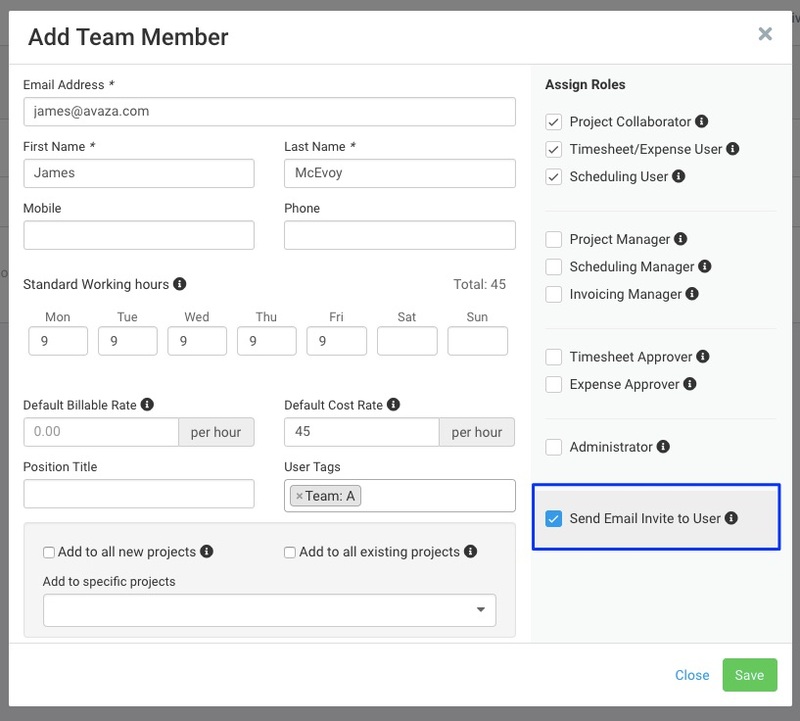 When adding a new team member, you can automatically add them to new and existing projects. The “Add to New Projects” and “Add to Existing Projects” checkboxes allow you to add new team members to projects automatically, so you don’t have to go in and add them manually when you set each project up (or to projects that already exist). Please note the “Add to Existing Projects” checkbox is a one-time action. You can also add users to specific projects if they only need access to a few existing projects. You can also assign team members various roles within Avaza. Unless you assign them a role, they will not receive an Avaza invite to join your account. Here is a guide on User Roles. Timesheet/Expense users, Scheduling users, Admins & Invoice Managers are the only roles that count towards your Avaza Subscription quota. Similarly to the Team tab, you can view the customer contacts, grouped by company, as well as contact information, role and the status of their invitation. If you assign a role to an external contact, you will see the option to send the invite to them and the last column will show the status of the Invitation. All external contacts must belong to a company and you need to set up a company while adding a new customer contact. Click the “Add External Contact” button to get started. 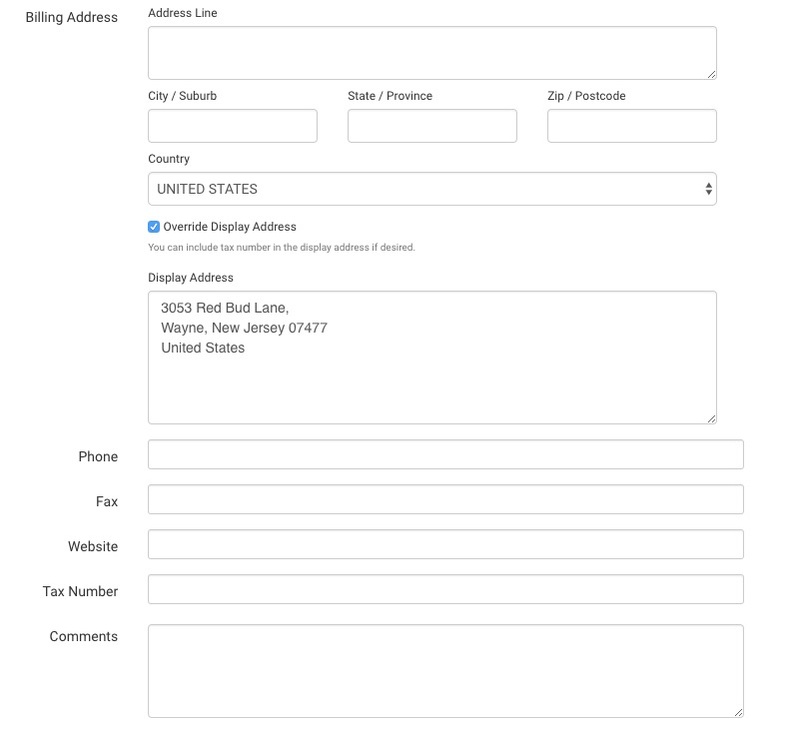 When adding a new contact, you can add a new company and fill out the remaining details at a later stage. To update company details, click on the company name directly from the Contacts page. 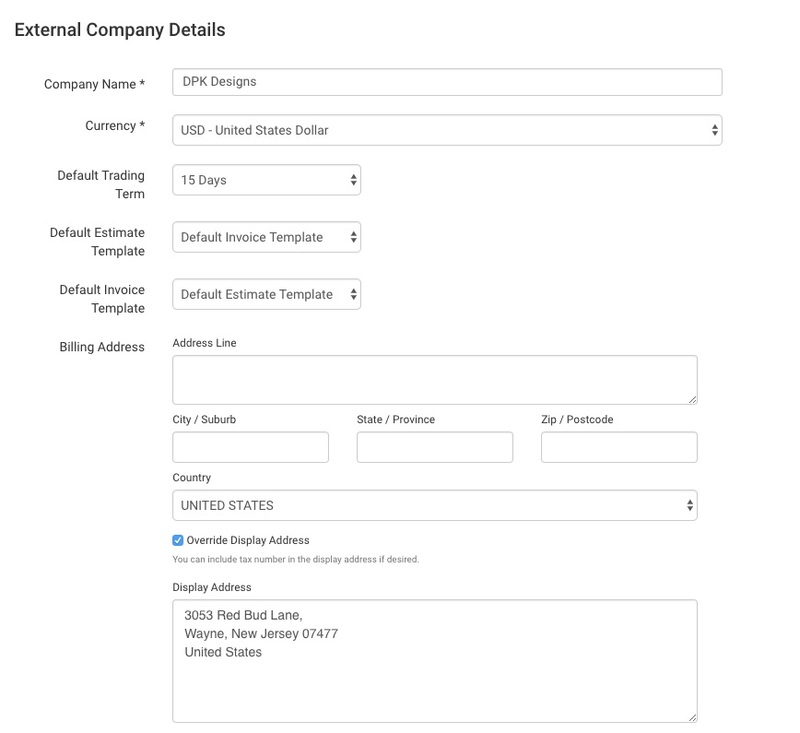 This will redirect you to a new page, where you can configure the default currency for the customer, add billing-related details and more. Default Trading Terms: This setting is used to set the Invoice Due Date. Billing Address: This address is used on the Estimate & Invoice. If you want to add a customer company without adding the name and email of a specific contact/user, you can simply add a new external company. 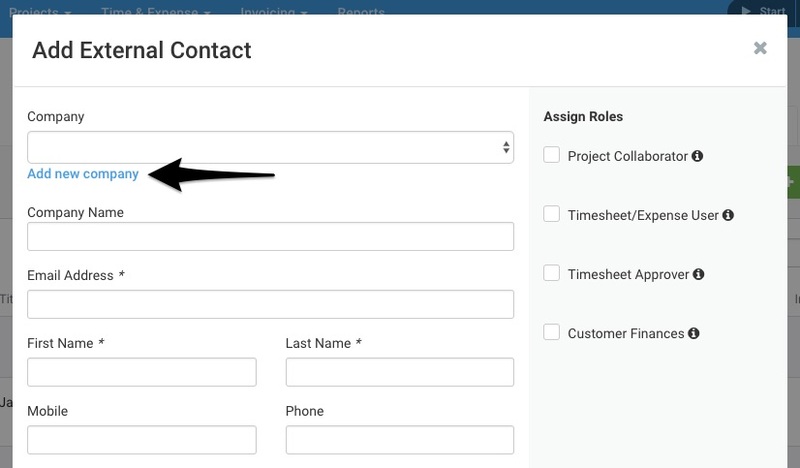 You can add external contacts to an existing company later by clicking the icon. 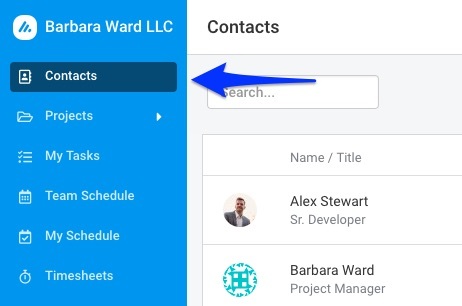 Customer contacts exist under companies, which is why when you click “Create Contact” you will first need to provide a company to add that contact under. Note: External contacts are not sent an Avaza invite by default. Only those contacts that have a role assigned to them (see below) will receive an invite. Mandatory fields include company, email address, and full name. 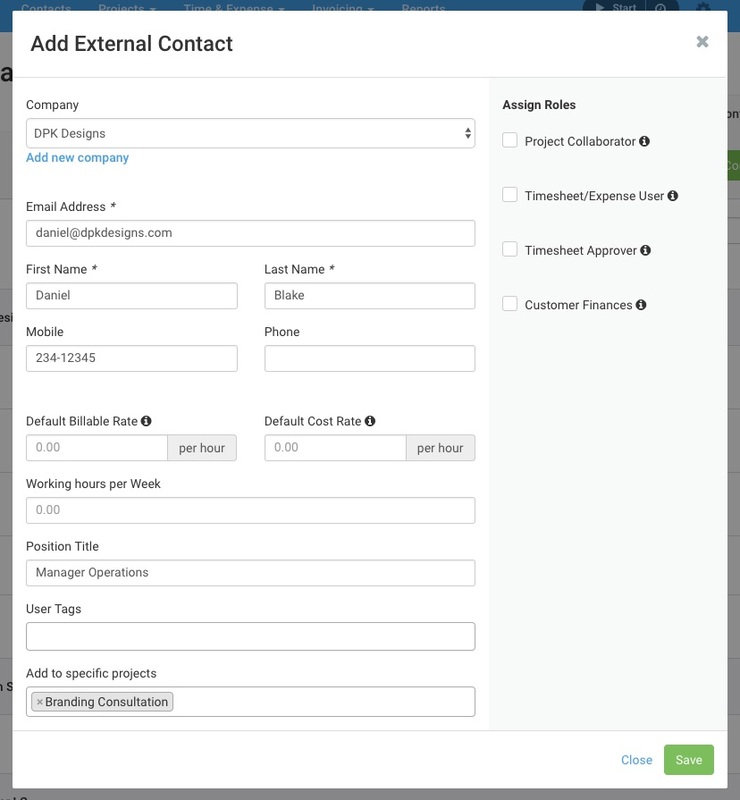 Each external contact can also be added to specific projects as long as they are assigned the Project Collaborator role, Timesheet/Expense user or Timesheet Approver. Project collaborator: can create and respond to tasks on projects they are members of. 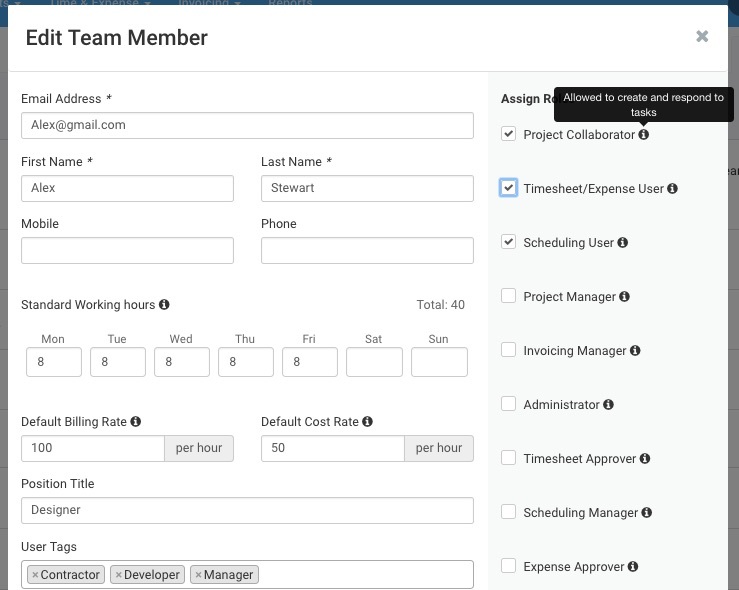 Timesheet/Expense User: can create and submit timesheets/expense entries for projects where they have timesheet access. Timesheet Approver: Can access/approve timesheets for projects where they are assigned timesheet approver permissions. Customer Finances: View quotes/invoices that have been created by you for their company. They cannot see Draft Estimates/Invoices. Assigning any of these roles to an External Contact will trigger an Avaza invite email inviting them to your account. You can easily bulk import contacts using Google Contacts or CSV files. Here is a FAQ on importing data into Avaza.